Who plans to participate ? 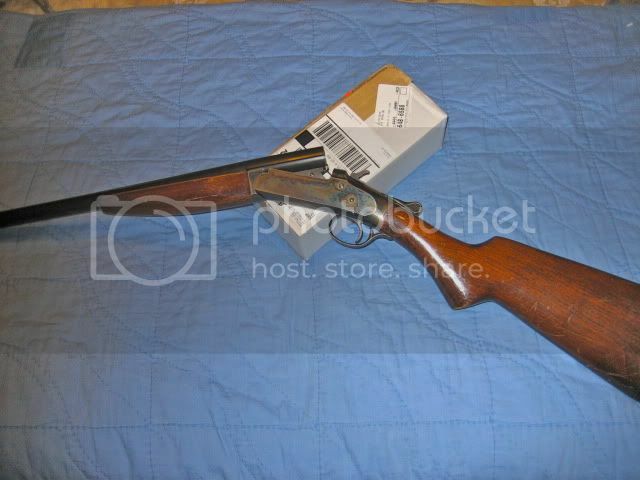 I've got a Winchester 1300 that won't function. Will that work? How about the guys with repeaters/doubles begin with just one in the chamber, have to stand on their second shell, under the forward foot, and reload from there? Or, they only get one shell to start and squadmates throw additional shells at them from 20 yards behind? No limit to how many shells can be thrown, when, or how hard. Or of what gauge. Gotta keep it sporting. How about they have to hold the spare shell in the fingers of the supporting hand ? I plan on participating. 16 ga Win 37, or 16 ga Invincible. No, single shot guns only!! I will be there with a matched pair of Gehas. Otherwise, someone with a Dickson would want to shoot with one shell in the left barrel. Am adament on that!! Mikey, I would be proud to be your loader. I know the drill. 16 ga. Excel. Mail order copy of Iver Johnson Champion from Montgomery Wards, I believe. I was planning on holding the second shell in between my fingers, probably on the forward hand. Kirk, the tossing of the second shell should work, as long as you shoot cross legged from the wrong shoulder. Having a loader sounds like a hoot. I watched JimH try to load for Wing once, hilarious. Anyone is welcome to use this one if you want to participate. OK, I have a loader. Just have to find another bolt-head! If I don't find one, I can perhaps borrow someone's Cooey and have a composed pair! Are loaders within the Spirit of this stage ? If you think I can hand Mikey another gun faster than he can reload, you have no humor in you soul. Any guidelines developed on this event? No tightie-whitie sniffing sounds like a good #1, but beyond that what're the ROE? I think we should have a 200 dollar Claimer rule.